BANGI, 12 November 2018 – The busy-ness of studying is not a hindrance to the UKMFC football team to honor Universiti Kebangsaan Malaysia (UKM) in the sports arena. Muhammad Hafiz Zalani, 23, a Bachelor of Education (Sports and Recreation) and captain of UKMFC, admit that one of the factors that effect him and his team members during their studies was time constraint. “Apart from having a lot of work, we also need to learn to manage the time with studying in between football and training. “Luckily our lecturers really understand our situation and always hold meeting sessions to teach us so that we don’t get left behind in our studies,” he said. Hafiz also cited the advice from his coach who always reminded them of the importance of education. “Even if you play football fondly, education must be prioritized,” he quotes the coach. He explains that besides being wise to manage time between academic and sports training, having enough rest is also important so that our momentum can be maintained to live the student life. “I am grateful that besides being able to celebrate the name of UKM in football, we can also successfully graduate,” he added. Hafiz, currently pursuing his Bachelor’s Degree in Education (Sports Management), at this campus intends to continue playing in the team to bring the UKM to a higher level. UKMFC won the runner-up at the 2018 Challenge Cup in September. 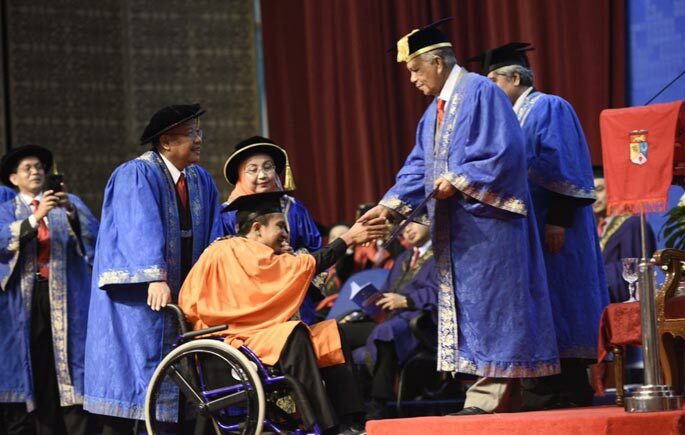 Hafiz graduated with his five other team members, Faiz Hanif Adnan, Gusti Ishak Fitri Shah Said, Ahmad Azridin Rosli, Muhammad Azri Zulkiflee and Helmi Hariri Ibrahim who recently paralysed.